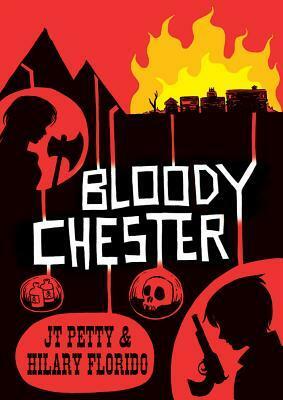 Bloody Chester is an atmospheric old Western graphic novel with a spooky set up and young anti-hero protagonist. The artwork is oddly cartoony, playing against the gritty and horror-filled story of a loser. This is not a story of redemption and the authors really buck cliches of the modern novel. I was reminded a lot of True Grit – no sappy ending, just the harsh realities of the American frontier. Chester, nicknamed Bloody Chester, is a hapless young teen drunk and loser existing on the outskirts of the town he just blew into. Willing to let himself get beat silly as long as there is a meal and whiskey in it in the end, eventually he finds himself in jail and with a proposition. The railroad is coming to the neighboring ghost town and the sheriff wants it burned to the ground to ease a superstitious fear that would keep railroad slaves from working the area. Chester is given a shave, a gun, and some food and heads out to the town of Whale to set to his pyrotechnic work. But what he finds is a place full of death and superstition, disease and insanity. Where the craziest people of all are actually the sane ones. What he finds is coyote waits. The author goes for the down and gritty – using graphic language, racist stereotypes, and the bitter ugliness of waking up with vomit on oneself. Chester is a thoroughly unlikeable character, weak, craven, and without conviction. But he’s smart enough to do what he needs to in order to survive – and doing so is killing the boy each and every time. On the surface, this is a simple tale of mystery with a bit of horror and possibly supernatural thrown in. It’s also a character study of how we fool ourselves and survival vs subsistence. Each of the characters that Chester meets seem simple on the onset but upon several reads, their character complexities and foibles manifest. There’s no one in the book as an aside – each have something to say about life and the overall arc. I think if you read this quickly and as a surface read, you’re going to expect some supernatural shenanigans and then an ending to the story that frustrates as a result. If you read this several times and a bit more carefully, however, the ending makes perfect sense and really shows the thought put into the story. I can’t help but feel that a more serious illustrative style might have been more interesting – the artwork is well done but leads the reader down a path of light skimming rather than pondering the story. I’m sure the editor appreciated that counterbalance but sometimes juxtaposing opposites like that neutralize each other’s strengths. That said, the story is easy to follow and well worth the read. I enjoyed this stand alone original story and really appreciated what the story brought to the graphic novel format. This entry was posted in Book Reviews, graphic novel, Historical. Bookmark the permalink.